BRYAN EATON/Staff Photo. 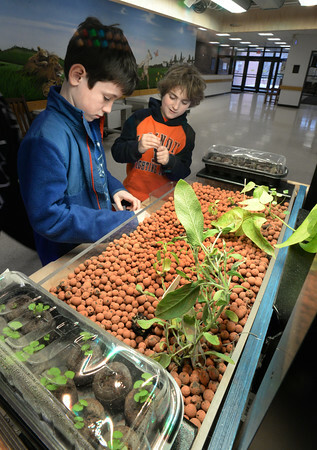 Kyle Flaherty, 9, left, and Calvin Buetow, 10, check the pH, ammonia and nitrate levels from the fish tank underneath the Grove Ecosystem at the Cashman School in Amesbury on Wednesday morning. The system provides algae to the fish below the plants, which in turn provide nutrients to fertilize the plants above teaching the students about the planet's ecosystem.